Practical, wise, and witty, Do Good Well is a groundbreaking book that offers a comprehensive and readily adaptable guide to social innovation that not only captures the entrepreneurial and creative spirit of our time, but also harnesses the insights, wisdom, and down-to-earth experience of today’s most accomplished young leaders. 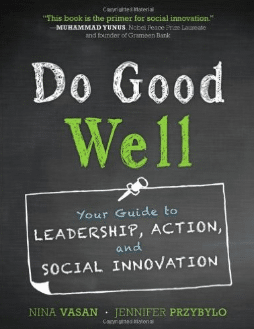 Written in a fresh voice and a dash of humor, Do Good Well avoids the typical generalized takeaways and overly simplistic “how-to” advice which lacks a grounding in a larger context. It delivers instead a winning combination of theory, anecdote, and application that walks you through the process of identifying a problem, developing an action plan, and then executing the plan in a way that will get results.